Landscape painter Harry Leith-Ross was born in Mauritius in 1886, a British possession in the Indian Ocean. He came to America as a seventeen year old. Before beginning, some ten years later in 1914, his studies at the Art Students League Summer School in Woodstock, New York at the relatively late age of twenty-eight, Leith-Ross had worked as a commercial artist. He studied with John F. Carlson and Birge Harrison at the League Summer School, and later with C. Y. Turner at the National Academy of Design in New York City. He then went to Paris, studying with Jean Paul Laurens at the Academie Julien and in England with Stanhope Forbes. Long associated with the Bucks County artists' colony in New Hope, Pennsylvania, Leith-Ross may have first gone there in 1912. It is definitely known that he visited the area in 1916 at the invitation of a student he had met when both attended the Art Students League Summer School in Woodstock, John Fulton Folinsbee. Birge Harrison, his former instructor at the League, whom he met again, was also there in New Hope during the winters from 1914 to 1916. The third and last generation of the New Hope colony would be comprised of artists like Leith-Ross, Folinsbee and Kenneth R. Nunamaker. It is somewhat ironic that Leith-Ross, so long affiliated with the New Hope School of American Impressionism, waited until 1935 to move permanently to that town on the banks of the Delaware River. Other artists in the community included Daniel Garber and the well-known Edward Willis Redfield, whose painterly style, Leith-Ross echoed in his landscapes of the region in the 1920s and 1930s. But, in the 1930s, Leith-Ross' style began to respond to the influences of modernism. Under the influence of Winslow Homer and Leith-Ross' grand-uncle, the well-known marine watercolorist Hendrik Willem Mesdag, 1831-1915, Leith-Ross painted his own realistic watercolors with a spontaneous fluency. As a boy, Leith-Ross had visited Mesdag's studio in Europe. Leith-Ross wrote The Landscape Painter's Manual, published in 1956. 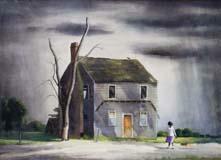 He taught painting in New Hope, Rockport and Gloucester, Massachusetts, and at the Art Students League Summer School. He was a visiting artist at the University of Utah, Southern Utah State College, and the University of Buffalo. Harry Leith-Ross was a member of the Allied Art Association, American Federation of Arts, Connecticut Academy of Fine Arts, the Salmagundi Club and National Academy of Design, in New York City, where examples of his work may be seen. He also exhibited at the Pennsylvania Academy of the Fine Arts in Philadelphia. Leith-Ross died in 1973.